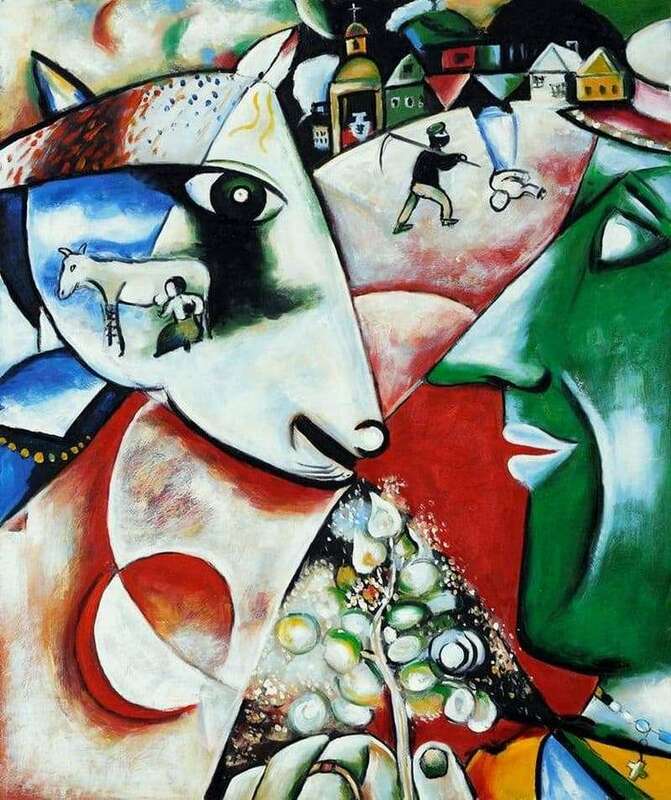 An oil painting “I and the Village” was painted by Marc Chagall in 1911. On the canvas, Chagall depicted not even the village, but his native city, Vitebsk, which he called the village because of his eternal serenity and harmonious coexistence between man and nature. Obvious elements of cubism are noticeable in a complex composition; in addition, division into sectors with lines intersecting at different angles is striking. Everything in this picture is endowed with a certain meaning, which is much deeper than the ordinary understanding of the word “village”. The head of the lamb is white and blue and overlaps with the image of a typical milking scene for the countryside. Looking further, we will see a village in which some of the colorful houses are turned upside down, an unnaturally big head is seen under the bell tower, and a man with a scythe is trying to talk about something with a girl going upside down. In this we notice a hint of the eternal difficulties of mutual understanding between the sexes. All this is nothing but the bright memories of a man with a green face, dressed in Russian clothes with a cross on his neck. He holds a twig or trunk of a small tree and, with his mouth slightly open, looks into the distance with blue and slightly clouded eyes. We can say that this is to some extent a self-portrait of the artist, who remembers the years of childhood with awe. The author of the picture divided the image into elements, each of which is a memory that flows into another, causes multiple associations, which allows you to create an extraordinary picture of the world. That is why one image appears on the other completely unexpected and even chaotic. The poet Blaise Sandrar, who was a good friend of Mark, came up with a name for the picture, and Guillaume Apollinaire, who spoke very positively about the artist’s work, called his works in this genre supernatural and surreal. Thus, for decades before the wide spread of surrealism, Chagall had already created paintings that exploded consciousness with their versatility and unusual ways of representing the world at that time.